And it is long may our champion bring victories o’er the wave. Saying, “Is that your English bully I hear bellowing again? Who used to juggle cannon balls when his day’s work was done? And to try his English muscle on our bold Benicia Boy. For she carried a bunch of thunderbolds well fastened in her claws. An the red crimson torrent from our Yankee’s nose did flow. An from his grasp he flung him, which caused the English men to stare. Look on this glorious eagle and never be afraid. So wherenver you boast of fighting, Johnny Bull, mind your eye. Traditional songs about sports are relatively rare. This is probably partly because last year’s sporting events are old news and partly because most of today’s popular sports are relatively recent inventions. So most of the sports songs we do have are about horse racing, or hunting, or (in Ireland) hurling — or about boxing. The fight described in this ballad was amazingly popular in song; there were at least eight printed broadsides about it! 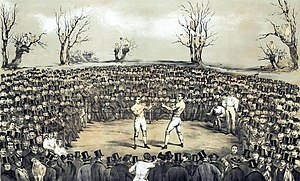 The fight took place on April 17, 1860, between John C. Heenan (called “the Benicia Boy” because he grew up in Benicia, California, though he was born in New York) and British champion Tom Sayers (1826-1865). The contest was fought in Farnborough, Hampshire, England. It is said to have been the last official bare-knuckle fight. It was also quite a battle, according to Rickaby: After 37 rounds, the watchers attacked the ring (perhaps to affect the outcome). The police ended up being called, and the boxers fought five more rounds. After more than two hours in the ring, they finally gave up; the match is considered a draw. Source: The lyrics are from Dean. As with many of his texts, the tune presents a problem. (Rickaby printed Dean’s text but did not provide a melody.) Although “Heenan and Sayers” is common, only a few tunes are known (the piece may have been done as a recitation rather than a song), and the other melodies I have encountered (one taken down by Peter Kennedy and one sung by A. L. Lloyd) are for texts very unlike Dean’s. I finally turned to the melody collected by Frank Warner from “Yankee” John Galusha, 1946 and printed in Warner, p. 62. This tune however may be damaged. The Galusha text is fairly similar to Dean’s, but this tune is most un-folk-like. It is in the Mixolydian mode, more or less, but it starts on an unfixed note and has a very irregular rhythm. I was sorely tempted to fix the opening (after the first line, it becomes more normal), particularly given the fact that Galusha had problems with pitch, but I have left his tune intact except for two places where I think the printed music had the timings wrong and one where I had to split a note to match Dean’s syllable count; any correction I would make to the pitches is as likely to be wrong as right. It’s still a pretty good tune — it’s just that it requires a slightly unusual approach if you are to play it on an instrument (Yankee John sang it a capella).